Bridebook.co.uk, the free app and website that connects couples with local UK suppliers, are thrilled to bring you the most comprehensive study on UK weddings: The UK Wedding Report 2017! 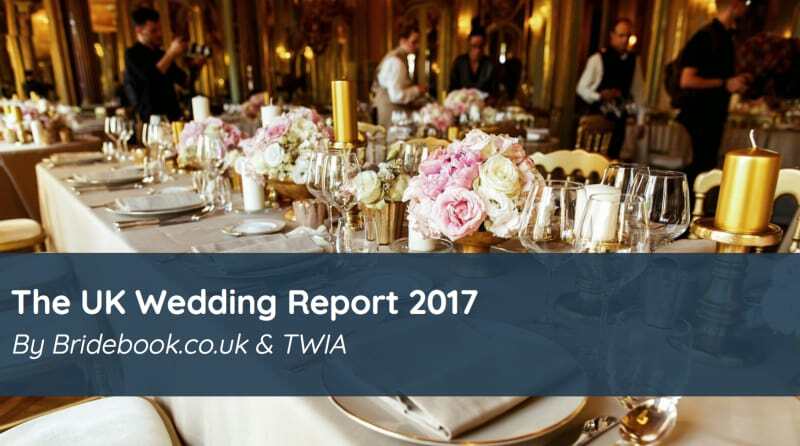 Together with The Wedding Industry Awards (TWIA), Bridebook.co.uk have examined the behaviours and spending habits of nearly 4,000 recently married couples in the UK. We’ve uncovered trends, statistics and average costs based on the real-life answers of UK newlyweds. Use these learnings to influence your business’s marketing strategy, inform decision-making and ensure your prices are competitive to help you book more weddings in 2017-2018. Haven’t claimed your FREE Bridebook.co.uk profile yet? Visit Bridebook Business to get started! There are 15,000 registered UK venues and suppliers with free profiles in the Bridebook.co.uk directory. By claiming/creating your free Bridebook.co.uk Business account, and adding all the information you love about your business (inc. photos, details, links to your social media, reviews and more), you are instantly searchable and accessible to our community of 40,000 couples (Top tip: the more information you add, the higher you will appear on search and the more couples will find you). Once your profile is complete, couples are able to view your business profile and contact you, sending all relevant lead information directly to your inbox – saving you time, and making sure that enquiries received are relevant to you and your business. How do couples find you on Bridebook.co.uk? 1 in 7 UK couples visit Bridebook.co.uk (and our newly launched iOS app) to plan their weddings with state-of-the-art free personalised wedding planning tools such as Checklist, Budgeter, Guestlist Manager and Advice which keep them on track from day 1 to wedding day. Couples visit Bridebook.co.uk week after week to follow their checklist tasks and search the supplier directory (the largest in the UK) for local providers every step of the way. Couples can filter their searches by location, style and specific offerings they want so they’re connected suppliers that best fit their needs. For any questions about your free wedding business profile on Bridebook.co.uk, email our friendly supplier success team at business@bridebook.co.uk who always want to hear from you. We look forward to helping make 2017-2018 a fantastic year for your wedding business!